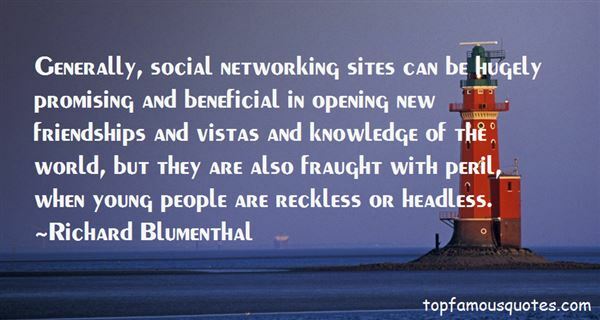 Reading and share top 4 famous quotes and sayings about Networking Sites by famous authors and people. Browse top 4 famous quotes and sayings about Networking Sites by most favorite authors. 1. "In Friendster's wake, a throng of social networking sites blossomed in San Francisco attempting to duplicate its appeal. Each tackled the idea of connecting people in a slightly different way. One was Tickle, a service which, on observing Friendster's broad-based appeal, altered its own service, which had previously been based on self-administered quizzes and tests. Two of the other new social sites—LinkedIn and Tribe.net—were founded by friends of Abrams." 2. "You look at the tremendous success of Facebook. To my mind there is not a lot of commerce going on in these social networking sites. eBay is a community anchored in commerce. It is a commerce site that built a community around it. 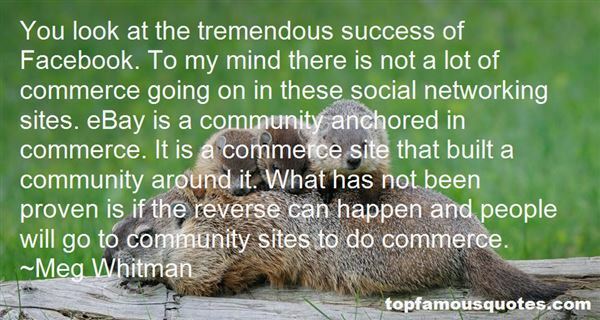 What has not been proven is if the reverse can happen and people will go to community sites to do commerce." 3. "Anyone can use these sites - companies and colleges, teachers and students, young and old all make use of networking sites to connect with people electronically to share pictures, information, course work, and common interests." 4. "Generally, social networking sites can be hugely promising and beneficial in opening new friendships and vistas and knowledge of the world, but they are also fraught with peril, when young people are reckless or headless." I don't call you handsome, sir, though I love you most dearly: far too dearly to flatter you. Don't flatter me."